This past weekend was a long one and full of parties and celebrations, which is probably why both Matt and I ended up with colds this week. 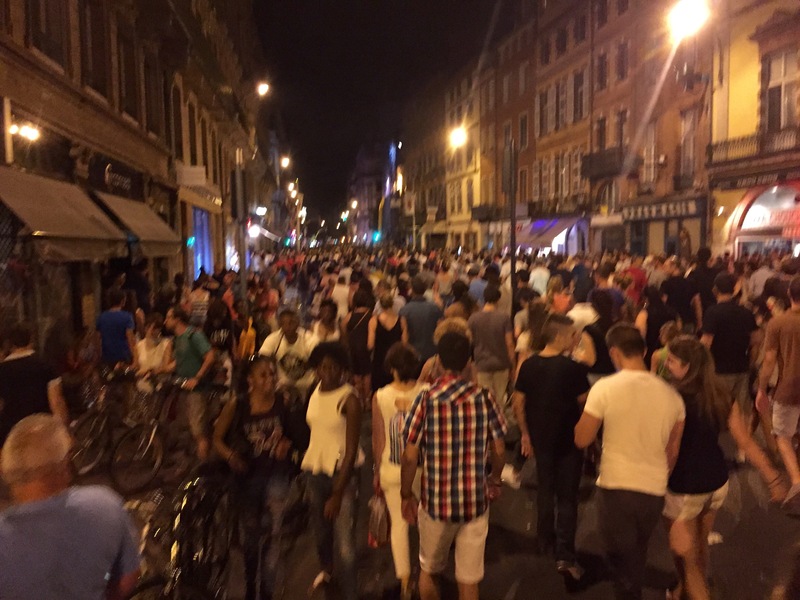 Let me just say that Europeans really know how to party. Obviously our poor bodies weren’t quite up to the challenge. Let’s start with start with Bastille Day here in Toulouse. Bastille Day (or la fête nationale, as it is more commonly known in France) is every July 14. It commemorates the storming of the Bastille on July 14, 1789 as the people of Paris rushed this prison and symbol of the absolute and arbitrary power of Louis XVI’s reign seeking ammunition and gunpowder. This was the beginning of the French Revolution and the end of the monarchy. It also commemorates la Fête de la Fédération, which occurred one year to the day of the storming of the Bastille to celebrate the new unity of the French people. 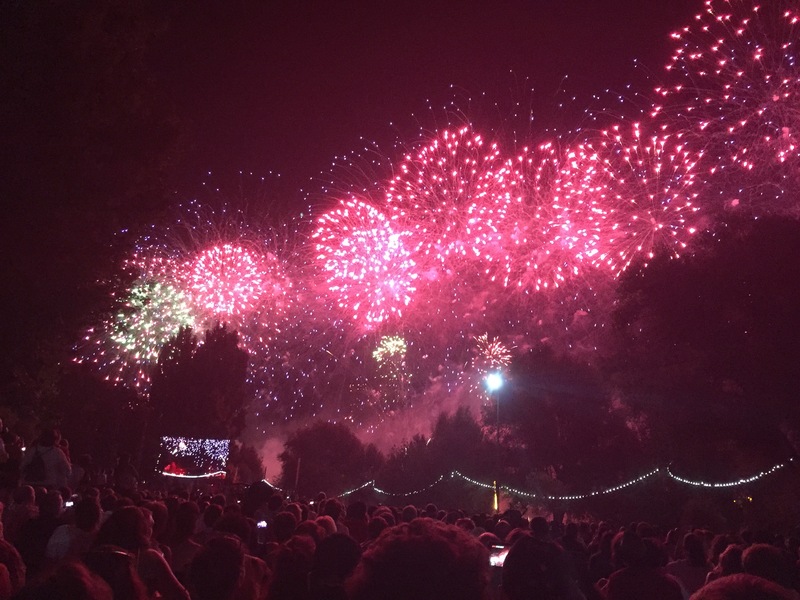 The most famous celebrations are in Paris and include a military parade down the Champs-Élysées and, of course, fireworks at the Eiffel Tower. After a crazy weekend in Spain, we opted to stay local and celebrate Toulouse-style. We slept until 11 took a long, leisurely morning getting ready and eventually made it out of the apartment around 1:30 to search for brunch. The streets were pretty quiet as many businesses were closed for the holiday, but as we got closer to the capitol we found some restaurants open–including Le Sherpa, our new favorite crêperie. 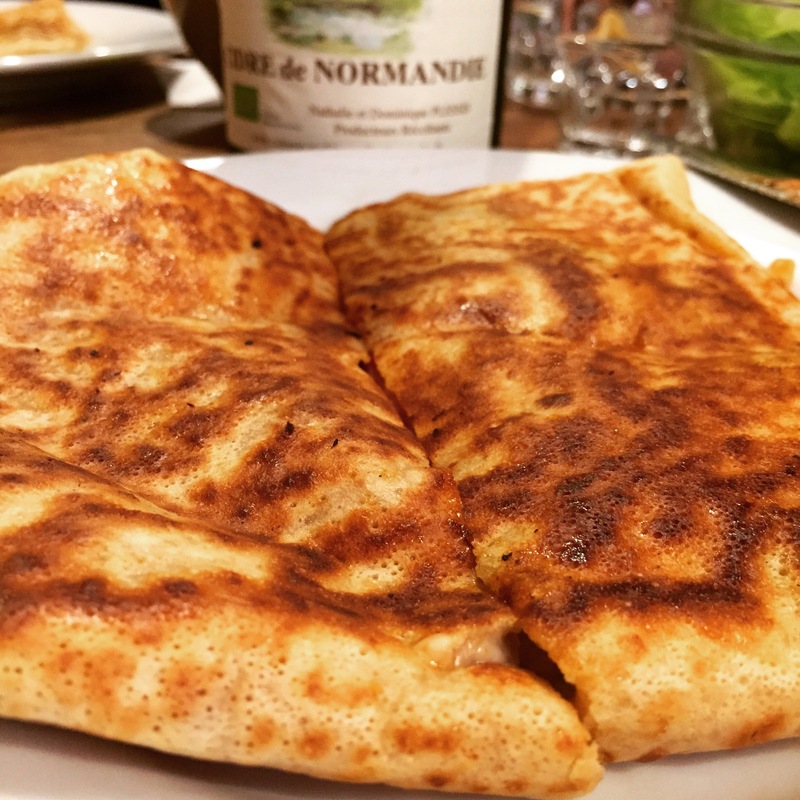 So we officially kicked off the holiday with delicious, savory crêpes and cider from Normandy. After breakfast, we made our way down to the Garonne River as most of the festivities were supposed to be going on down there. 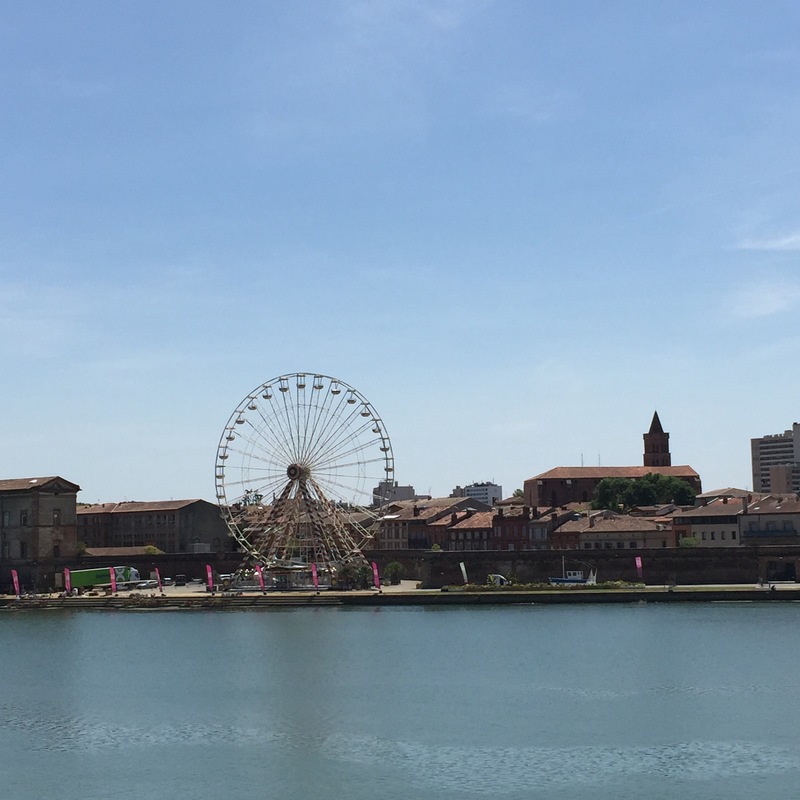 We did see a pretty Ferris wheel across the river, but for the most part it was still pretty quiet–even at about 3:00 in the afternoon! I guess we shouldn’t have been too surprised considering how late a lot of things start around here (the fireworks weren’t even scheduled to begin until about 11:00). We did eventually hear music and found a stage on the other side of the river, but at this point they were just doing soundchecks. So we sat on a bench in the shade for a little while and debated what to do. It was so hot we didn’t really feel like going all the way back to our apartment to pick up stuff for a picnic, but we didn’t have blankets and coolers to get us through the long haul until the concert began (we later found out it wasn’t starting until 8:45). Finally we decided to see if we could rent city bikes (called VélÔToulous here) and fortunately we found a rack close to us. It worked! We had a quick and easy way to make the round trip to pick up supplies. About an hour later we were on our way back to the river to lay our claim on spots from which to watch the concert and fireworks. Activity was picking up by the time we got there and now security guards were checking bags before people could walk in. We soon discovered that they were checking for alcohol–no one was allowed to bring adult beverages into the concert area! Well, we weren’t going to let good bottles of Bordeaux wine and Normandy cider go to waste and apparently we weren’t the only ones who didn’t know about the restriction. 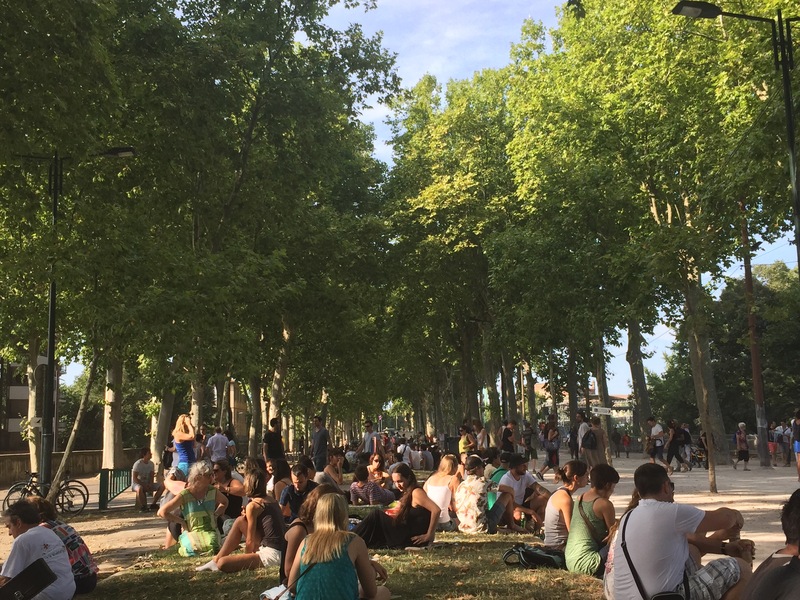 Pretty soon the entire median across from the park was filled with surprised picnickers who weren’t about to throw their bottles out either. Frankly, I was surprised they didn’t raise an army and storm the beer tents! Free drinks for all! I know what you’re thinking: perhaps they just didn’t want people drinking at a family event. Wrong! There were vendors selling beer inside the gates. We suspected the vendors just didn’t want the loss of business from people supplying their own beverages. Did I mention I was surprised there wasn’t a storming of the beer tents! Free drinks for all! Eventually we made our way into the park and claimed a free space in the quickly filling park. It wasn’t long before we had people on all sides of us–and we were towards the back of the park. The set-up along the river was really nice. There was a big stage at the front of the long stretch of green and those who wanted to stand and be close to the band were able to. 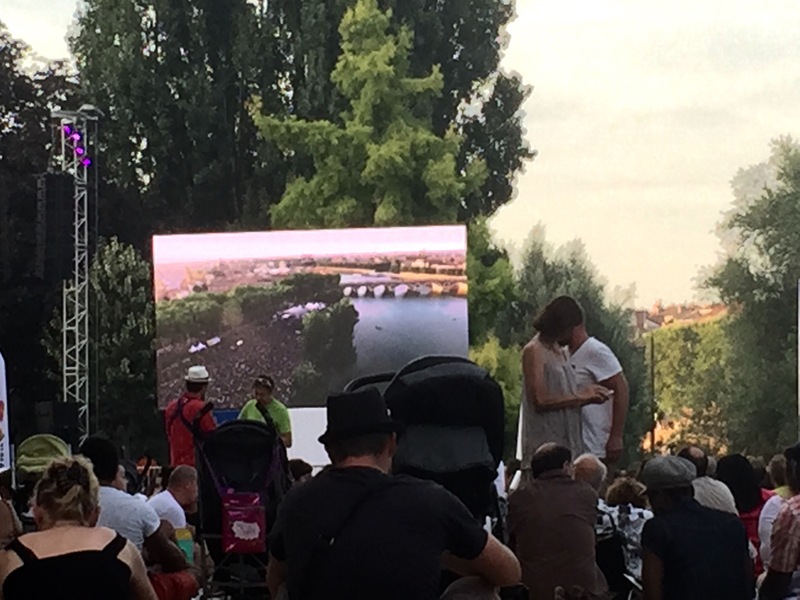 Those who preferred to stretch out on a blanket could sit a little further back, but big screens and speakers made it possible to see all the action no matter where you stood or sat. The headliner band for the night was Cats on Trees, a popular French band hailing from Toulouse. They were really quite good and sang a mix of their own songs and covers of other Top 40 hits. They played for about two hours with special guests Ayo, Vianney and Emji. We really enjoyed the concert. 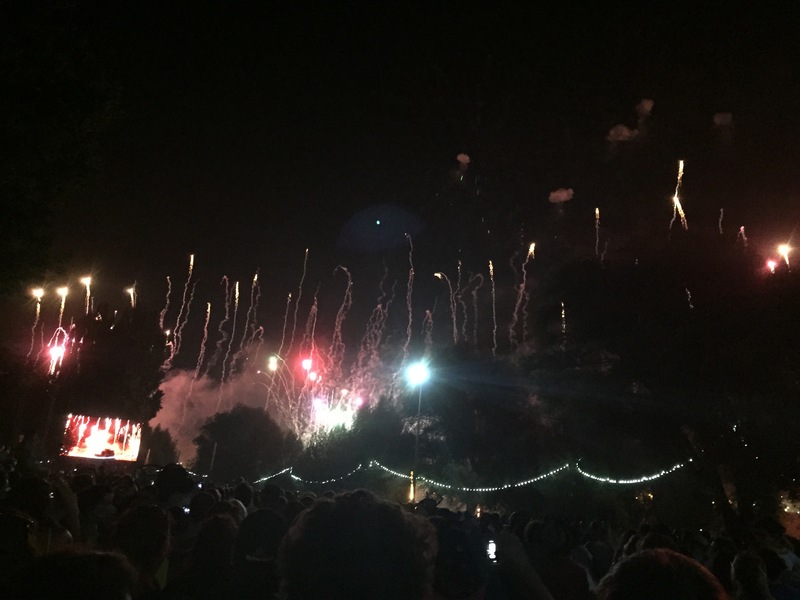 At about 11:00, the firework show began and we all agreed it was one of the best we’ve ever seen. Set to music from popular movies (including Star Wars and Harry Potter), the fireworks were set off from the river and fully engulfed our field of vision. Here are a couple of photos and a quick video. Once the fireworks were over, everyone hit the streets at once. It was a literal madhouse trying to make our way back home. Cultural side-note: France is so beautiful and makes such good wine, cheese and bread, but if there’s one thing that baffles me it is the smoking. As much evidence as there is about the dangers of cigarette smoke, it is highly prevalent here–even at family events where children are subjected to heavy clouds of second-hand smoke. The security at the concert was very concerned about making sure no alcohol made it in (even opening and smelling water bottles), but there was a literal haze of cigarette and marijuana smoke hovering in the air throughout the concert. Oh France, if you could just get your smoking under control, I think we could consider a long-term relationship. That aside, it was a really fun day and great chance to enjoy similar festivities to the holiday we missed back home–the Fourth of July. Viva la France!